White, Gloss Laminated EuroTotes, 9" x 3.25" x 7"
Dimensions: 9" x 3.25" x 7"
Black, Gloss Laminated EuroTotes, 5.5" x 3.5" x 6"
Dimensions: 5.5" x 3.5" x 6"
Black, Gloss Laminated EuroTotes, 6.25" x 3.5" x 8.5"
Dimensions: 6.25" x 3.5" x 8.5"
White, Gloss Laminated EuroTotes, 8" x 4" x 10"
Dimensions: 8" x 4" x 10"
White, Gloss Laminated EuroTotes, 16" x 6" x 12"
Navy Blue, Gloss Laminated EuroTotes, 16" x 6" x 12"
Black, Gloss Laminated EuroTotes, 8" x 4" x 10"
Black, Gloss Laminated EuroTotes, 16" x 6" x 12"
Silver, Gloss Laminated EuroTotes, 9" x 3.25" x 7"
Silver, Gloss Laminated EuroTotes, 8" x 4" x 10"
Royal Blue, Gloss Laminated EuroTotes, 5.5" x 3.5" x 6"
White, Gloss Laminated EuroTotes, 13" x 5" x 10"
Dimensions: 13" x 5" x 10"
White, Gloss Laminated EuroTotes, 5.5" x 3.5" x 6"
Silver, Gloss Laminated EuroTotes, 16" x 6" x 12"
Black, Gloss Laminated EuroTotes, 9" x 3.25" x 7"
White, Gloss Laminated EuroTotes, 6.25" x 3.5" x 8.5"
Copper, Gloss Laminated EuroTotes, 16" x 6" x 12"
White, Gloss Laminated EuroTotes, 16" x 6" x 18"
Dimensions: 16" x 6" x 18"
Red, Gloss Laminated EuroTotes, 8" x 4" x 10"
Red, Gloss Laminated EuroTotes, 16" x 6" x 12"
Silver, Gloss Laminated EuroTotes, 5.5" x 3.5" x 6"
Silver, Gloss Laminated EuroTotes, 6.25" x 3.5" x 8.5"
Copper, Gloss Laminated EuroTotes, 6.25" x 3.5" x 8.5"
Copper, Gloss Laminated EuroTotes, 8" x 4" x 10"
These Euro Tote Bags are laminated with the finest quality lacquer over heavy paper. The top of the shopping bag features a turned edge for strength and added elegance. The cord handles are made of high quality rope strung through grommets and tied to the inside of the bag for a secure hold. These bags would look great with your name custom printed on them. 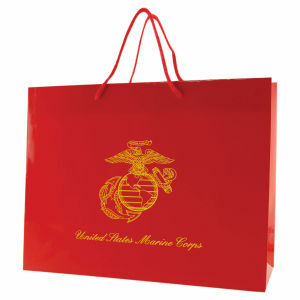 These bags make great gift bags, retail shoppers, swag bags and more!